I stamped the pears in honey ink and then sponged one side with a little olive. This would be a simple card to duplicate as a set of gift cards. I truly love the addition of the twine. It's just such a delicate touch. I hope you are starting a happy and blessed weekend! 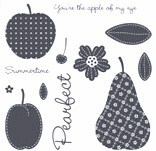 Gorgeous, love how you did the pears! I just checked out all your classes...sounds like so much fun! Wish I could come! Love your work! I just ordered this paper! I think I want to order the kit now too. You inspired me! TFS! OHH TOO CUTE! I love love love that! Very adorable!I might do something like this for a wedding i'm going to!